Truth be told, even though we didn't want to live in Chicago, we were very happy for Eli to be a student at Loyola. 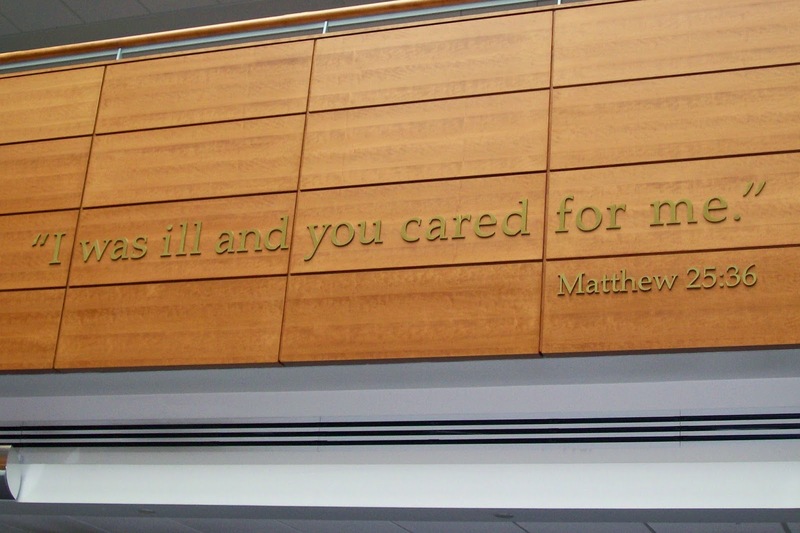 It's a Jesuit school that focuses on the value of service, and what could be better for a future medical missionary than to prepare in an environment that combines the attributes of healing and service? Loyola welcomed us with open arms. The previous year when Eli had been accepted by Loyola but hadn't yet taken the offer, he was hounded by a faculty member who kept calling him to see if he was going to accept. When they finally connected on the phone and Eli explained that he wouldn't be coming that year and why, the man's response was, "Well you're going to reapply next year then, aren't you?" He made it clear that Eli was the kind of person their med school wanted to take under its wing. And sure enough, Eli did reapply and was reaccepted. 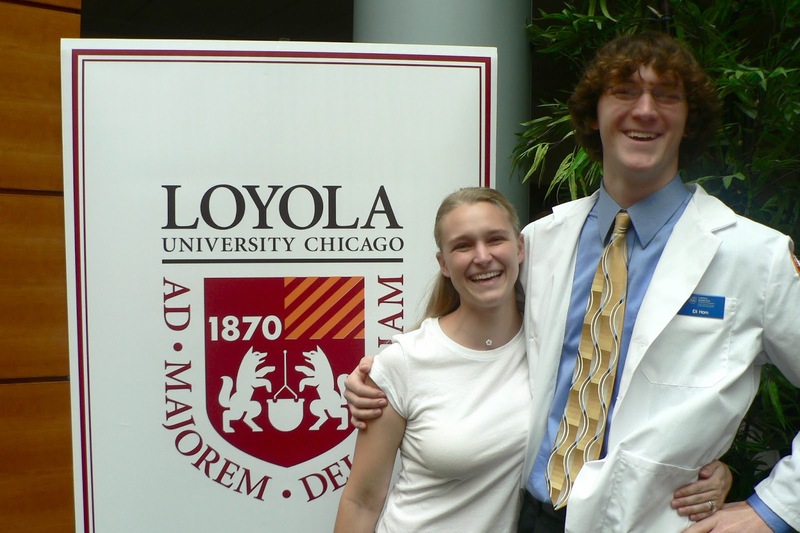 Not only that, Loyola granted him a scholarship to help with the cost of tuition - a rare asset to receive for graduate medical education in the States. 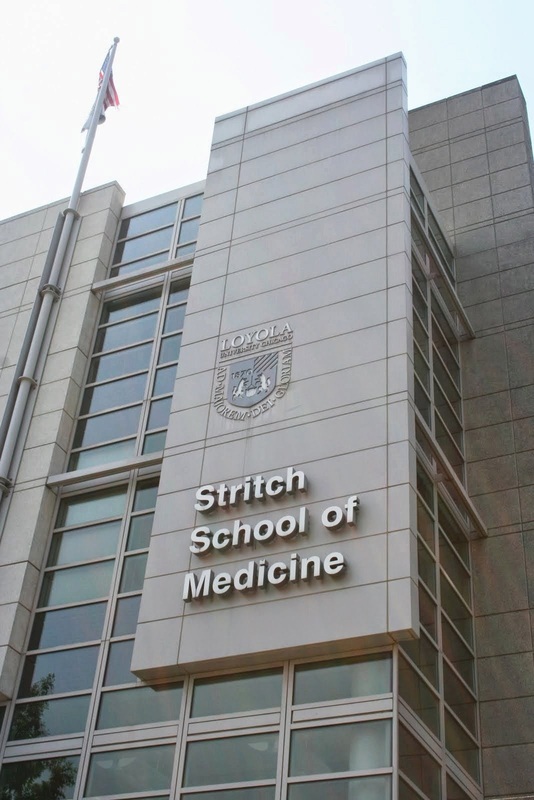 So in the summer of 2007, less than two months after returning from Cameroon, we joined the next wave of folks starting at the Stritch School of Medicine for a four-year trek towards an M.D. (I say "we" because this was very much our journey, not just Eli's.) And we loved Loyola from the start. We loved the Jesuits and their love for education and service and Jesus. We loved the inclusion of spouses in almost everything. We loved that our med school had a ministry office filled with people who truly cared about us and how we were surviving those strenuous years. And we loved the undercurrent that healing is not just a job to be done, but a service to be rendered. Being in such an environment gave us hope that, yes, we were where God wanted us to be and we would be alright. God was providing. What was the scholarship committee looking for in potential recipients? Service. The woman in Financial Aid told Eli that he was chosen in great part because of his time serving in Africa prior to med school. She said the committee easily agreed that Eli should be one of the recipients and the only difficulty was narrowing down who the other recipient would be. We were awed and humbled, to say the least. The scholarship was not something to be applied for, but simply something to be awarded. And it was awarded to Eli. Had we chosen for Eli to attend med school the previous year instead of going to Africa, the scholarship would not have existed yet and could not have been awarded to him. Had we not gone to Cameroon the year prior to med school, Eli may not have stood out to the scholarship committee as someone particularly devoted to service. So God had intended for us to be in that place at that time all along and He was working to provide for our future in missions by helping us handle our ensuing debt years down the road. Furthermore, He was continually highlighting the importance of service as we prepared for the mission field. Loyola was an ideal environment to cultivate this because it offered service opportunities for even the busy medical student to participate in. For example, Eli (and sometimes I) volunteered with a weekly ministry to the homeless in Chicago in which we'd meet at the Jesuit house in Oak Park and make sandwiches before heading out to drop them off at a certain location downtown. Eli eventually took over the leadership of this ministry during his second year. 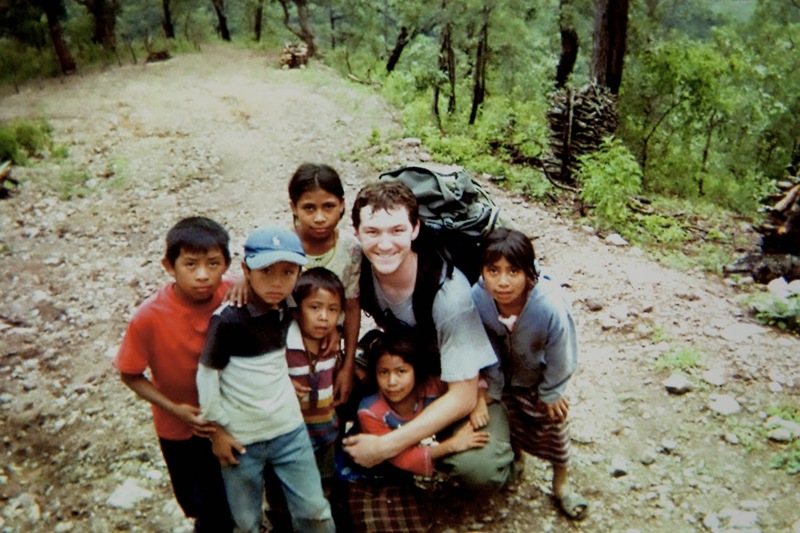 Another opportunity Eli had was to spend three weeks in between his first and second year on a medical service trip to Guatemala in which he and other Loyola students trekked through the mountains to set up day clinics in remote villages. Those service opportunities were priceless in and of themselves, but were also essential in reminding us that we have been called to a life of service because we follow the Servant, Jesus, who was chosen and loved and delighted in by the Father (Isaiah 42:1, Matthew 12:18). From the first day of orientation at Loyola, God was faithfully showing us why He had sent us to Chicago. He had to shut the door to Minnesota to make sure we got there, but He was faithful to lead us. Our mission trip to Cameroon had been a stepping stone as we walked through the doors of a service-oriented medical school and continued learning what it means to work and heal with the heart of a servant. It was an education of the heart as well as of the mind. It wouldn't be the only education we'd receive while living in Chicago, however, nor would it be the only financial provision that God would offer for our future. While Eli was plugging away at med school and I was struggling with a difficult job and a failed knee surgery among other things, the Lord eventually opened another door that would both educate us and provide for our future in missions: graduate school at Wheaton. We were still in Cameroon when we started praying that if God wanted us to be in Chicago for med school, that He would close the door completely to the University of Minnesota. We knew ourselves well enough to know that if given the choice, we'd choose to stay in Minnesota over going to Chicago. Minnesota was familiar, friendly, and fascinating. Chicago was cold, congested, and cacophonous. But the Stritch School of Medicine at Loyola in Chicago had already accepted Eli as a future medical student. A spot was waiting for him if he chose to accept it. Eli was definitely going to med school. It was simply a matter of where. We were still waiting to hear from U of M. If they were willing to take him, that's exactly where we'd choose to be. We were hopeful because Eli could have gone to U of M the year before. We had been forced to turn down the opportunity because the deferral date had passed by the time Eli was accepted. (We knew we were supposed to go to Africa that year, so our hope was that he'd be accepted by a med school and then defer for one year while we went to Africa, in which case a spot would have been saved for Eli the following year.) But the deferral date had already passed, so we either had to go to med school that year (and forgo Africa altogether), or turn down the offer completely in favor of going to Africa and starting the process of applying and interviewing for med school all over again. We "foolishly" chose the latter. "For the foolishness of God is wiser than human wisdom" (1 Corinthians 1:25) and "the wisdom of this world is foolishness in God's sight" (1 Corinthians 3:19). All that to say, because Eli was given the opportunity to attend med school at the University of Minnesota the first time around, we were hopeful that he'd be given a second chance when he reapplied. But hope and faith are funny things. We hope for something and sometimes get what we want. At other times, we hope for something but the Spirit gives an impression that our hope may not be realized. Sometimes our hope and our faith align, and sometimes they do not. Always, though, our true hope is in Christ alone, because "in him we were also chosen, having been predestined according to the plan of him who works out everything in conformity with the purpose of his will, in order that we, who were the first to put our hope in Christ, might be for the praise of his glory" (Ephesians 1:11-12). So Eli and I were sitting in our borrowed house in Cameroon and getting a nudge from the Spirit to pray something that's very hard to pray: "Your will be done." I have found, time and time again, that when the Spirit nudges me to pray this prayer, it usually means I'm not gonna get what I want. I've also found, however, that time and time again, when I'm willing to pray this prayer I am propelled into a journey that molds me and matures me in ways I never could have grown had I not been willing to submit and obey and pray that prayer. So we felt the nudge and humbled ourselves and prayed: "Lord, if you want us in Chicago, please let Eli get turned down by Minnesota." Not our will, but Yours be done. Jesus prayed those words in Luke 22:42. And then He was crucified. I was sensing a premonition. Sometimes I utter that prayer and it doesn't affect me because I either feel like my desires already align with God's, or because I'm truly indifferent about whatever might happen. Other times, however, I whisper that prayer painstakingly. It costs me something just to say it because what I'm hoping for is probably not what God knows needs to happen. When my own will is strong and decisive (as it often is), it is desperately hard to pray, "Your will be done." Following through with that prayer becomes an act of obedience more than anything else. But we love God, and we trust Him more than we trust ourselves, so we prayed that prayer as we wondered about Eli's future in medical school, and handed everything over to Him. Well, God did what God wanted to do. He closed the door to Minnesota and asked us to follow Him in faith to Chicago. I may as well confess that I did not go to Chicago quietly. Even though I knew it was where God wanted us, I went kicking and screaming. I began grieving once we came home from Africa and the reality hit that we needed to pack up and move within a month's time and begin the next phase of our life for four very long and arduous years in a city that I knew I didn't want to live in. I remember standing on the sidewalk at my in-laws' house about a week before the move, and out of nowhere I started crying just thinking about having to spend four years in that busy, bustling, burdensome place. I was not a city girl, and although Eli grew up in a city, he did not desire to live in one again. Chicago? "Why, oh why, God, are you sending us there???" I was resigned, but I kicked and screamed anyway. This was definitely a sort of cross to bear. I was obedient to pray the prayer that needed to be prayed, but when God answered the way He wanted to answer, I thought He should at least know how I felt: dejected and not a little ticked off. What I can say is that despite my frustration and depression going into this major life transition, I did actually believe that God knew what He was doing, and we obeyed. We went to Chicago. And God was faithful. Ever so faithful. And He was patient with me and my ranting and raving about being asked to live in that Cementville of a city. Despite my struggles - because it was a true struggle and not just an ongoing whining session as it may sound - God was faithful to us as we obeyed Him and continued to acknowledge that He had led us there for His purposes. It's all the more clear in hindsight (as it usually is). We were meant to be in Chicago. I could give a litany of reasons why, but the reasons that confirmed our calling and kept us on the path to missions are a highlight, starting with Loyola.